From 11.30-1pm on Sunday 7/12 at Artist Alley table BB-03, artist Dan Parsons and I will sign Empire of the Wolf! If you’re in town, come on by! From 1-3pm on 7/11 at Artist Alley table BB-03, artist Dan Parsons and I will sign Empire of the Wolf ! Dan might even add his signature wolf — carpe lupum! 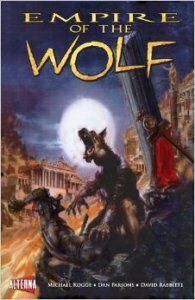 The great Frank Mula of the comic news site Comic Crusaders interviewed me recently about the graphic novel I wrote, Empire of the Wolf. Check out the interview here! They also posted a preview of the book, with 5 pages. EMPIRE review on Jedi News! Jedi News’ Jonathan Hicks had this to say about Empire of the Wolf: “This is possibly one of the best things you could ever put in front of me…” Read on! EMPIRE Signing Weds. Oct 29 5-7pm at Hi De Ho Comics in Santa Monica! The evening of Wednesday, October 29, I will be signing copies of Empire of the Wolf at Hi De Ho Comics from 5-7pm at 1431 Lincoln Blvd, Santa Monica, CA 90401. Come stop by, grab your Wednesday pull-list, and pick up a printed copy of Empire!